The picture below shows F/O Allen and crew. F/O Allen and crew were flying when NF932 failed to return on 13 February 1945 from Operation Thunderclap to Dresden; NF932 was in collison with a Polish Lancaster soon after setting course for the target. The crew arrived at North Killingholme in September 1944 with their first operation being Duisberg on 14th October flying BQ-V PA995, "The Vulture Strikes! ", one of three 550 centurions. 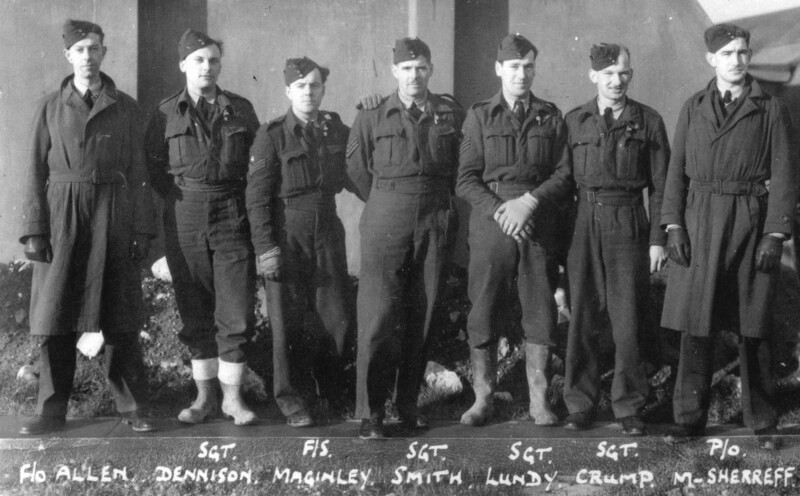 They were killed after colliding with a Lancaster from 300 (Polish) Squadron at approximately 8000 feet near Wragby, Lincolnshire when setting course for Dresden on 13 February 1945 flying BQ-B2, NF932 (named "Macnamara" after the popular song of the era). An eye witness reported that the aircraft landed in a field near Apley but exploded shortly after touching down. It was an all British crew and there are three graves (two unnamed and that of P/O Murray-Shirreff) in Newport Cemetery, Lincoln. The other members of the crew are buried nearer to their home addresses. There is further information on the crew and the accident, and if any family members wish to contact the holder through the Association website then this can be made available (web-site contact details in the page footer).